This is our 2018 recipe list full of creative recipes for some of those more uncommon produce items. Enjoy! 1. Remove any large stems from the greens and discard. Tear the leaves into bite-sized pieces. In a deep pot or wok, sauté the onion in a tablespoon or two of vegetable broth until mostly faded to pink, about 4 minutes. Add the chopped garlic and red pepper and another tablespoon of broth and cook, stirring, for another minute. Add the mustard greens, 2 tablespoons of broth, and cook, stirring, until greens are wilted but still bright green, about 3-5 minutes. Stir in the salt, if using. Remove greens and onions from pan with a slotted spoon and place in a serving dish, leaving any liquid in pan. 2. Add the balsamic vinegar, soy sauce, and agave or sugar to the liquid in the pan (if there is no liquid, add 2 tablespoons of broth). Add the chickpeas and cook, stirring, over medium heat until the liquid is reduced by about half. Spoon the chickpeas over the greens and drizzle the sauce over all. 3. Serve warm, with additional balsamic vinegar at the table. 1. Preheat oven to 400°. Wrap beets in foil and roast directly on rack until tender, about 1 hour. Let cool, peel, and cut into ¾” pieces. Place in a small bowl and toss with 2 Tbsp. oil and 1 Tbsp. vinegar; season with salt and pepper. Let sit at room temperature 30 minutes. 2. Meanwhile, toss potatoes on a large rimmed baking sheet with 1 Tbsp. oil; season with salt and pepper. Roast, tossing occasionally, until golden brown and tender, 25–30 minutes. Let cool slightly. Transfer potatoes to a large bowl and add scallions, mustard greens, dill, parsley, horseradish, lemon juice, remaining 4 Tbsp. oil, and remaining 1 Tbsp. vinegar. Toss to combine; season with salt and pepper. Add beets and toss again. Serve drizzled with crème fraîche. 2. Remove the tops and the roots of the beets and peel each one with a vegetable peeler. Cut the beets in 1 1/2-inch chunks. (Small beets can be halved, medium ones cut in quarters, and large beets cut in eighths.) Carrots, peeled and cut into 1/2 inch slices (on the diagonal). 3. Place the cut beets and carrots on a baking sheet and toss with the olive oil, thyme leaves, salt, and pepper. 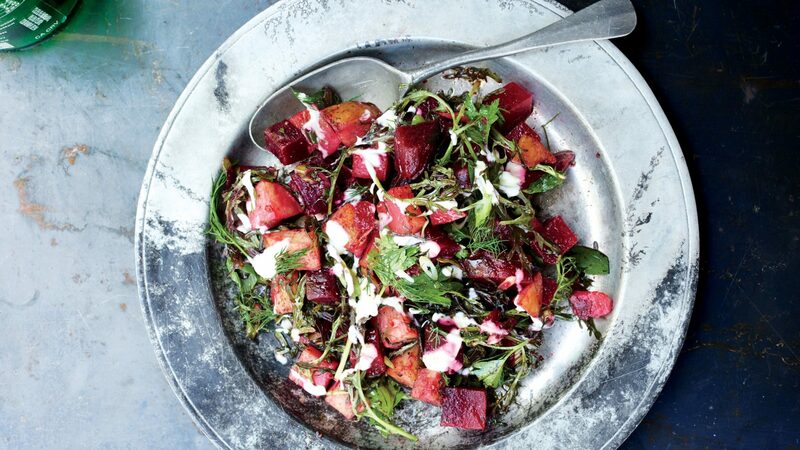 Roast for 35 to 40 minutes, turning once or twice with a spatula, until the beets are tender. Remove from the oven and immediately toss with the vinegar and orange juice. Sprinkle with salt and pepper and serve warm. blender or food processor. Blend continuously until the ingredients start to breakdown. If you prefer a more coarse pesto, use the pulse setting. Stream in the olive oil and allow the ingredients to emulsify with the oil. You want to continue processing until the oil is combined with the basil and your other ingredients. Taste the pesto, add additional garlic or Parmesan to preference. 2. STORING: Store the pesto in a small container (where the pesto fits all the way to the top and press to reduce air pockets. Homemade pesto can be stored in the refrigerator for up to 1 week. You can also pour the pesto into ice cube trays and freeze. Remember to transfer the frozen pesto to a zip top bag once frozen. NOTES: You can replace the pine nuts with cashews or almonds.